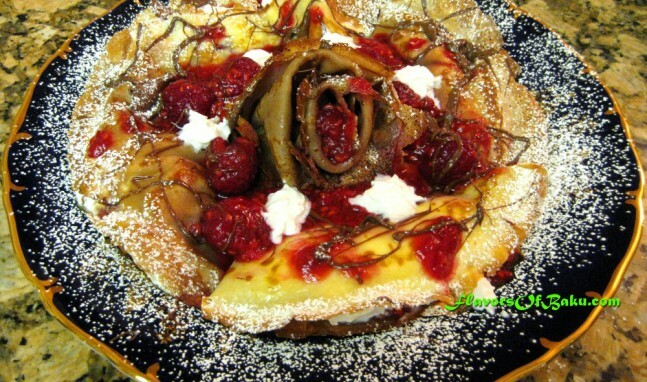 Combine crepes ingredients in a bowl and whisk until all the lumps are out, and set aside for a 30 minutes. Divide batter into two parts. In one part put a teaspoon of Nutella and mix well. Heat a non-stick skillet over medium heat and spray with some olive oil. Use soup ladle to pour your crepes batter into the skillet. Holding onto the handle of the skillet, remove it from the heat and swirl the skillet so the batter completely covers the bottom. It should be as thin as possible, just eyeballing the amount of the batter. If you have holes in the crepe, add more batter to the skillet to cover them. Return the pan to heat. When crepe has firmed up, the bottom has slightly browned and top has lost its shine, using a heat-resistant spatula, carefully loosen the sides and gently flip the crepe over to another side by using your fingers. Cook for a few seconds and move it to the plate. Stack all crepes on top of each other. Repeat until you have all your crepes made. From your batter you will get approximately 3 chocolate and 3 regular crepes. Now it’s time to fill the crepes. Mix in a pan fresh raspberries with sugar, add water and simmer over low heat for 5-10 minutes. Slightly melt chocolate cream Nutella, because it is thick and doesn’t spread well, especially over something delicate like crepes. Melting can be accomplished in a microwave or over a hot-water bath. Fold your crepes in half, spread Nutella chocolate cream, put raspberry syrup and whipped cream on chocolate. Then fold crepes in half again, forming triangle. Decorate with raspberries and dust with powdered sugar.